Samples of my Visual Merchandising work, both for window and interior displays. I usually like to start with a theme for my product mix, which I edit down to a harmonious color palette to make the display seem unified. All props are hand-painted/crafted by me before installing the display. In the Grocery Store window I hand-painted the signs and decals, and created the yellow plaid wall paper by carefully layering different shades of masking tape. 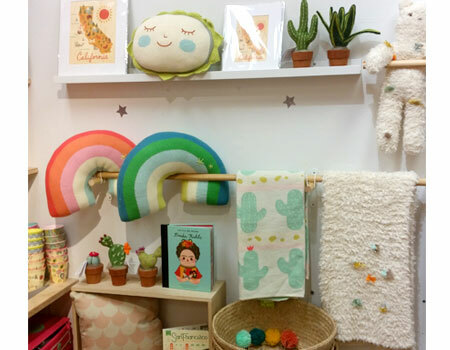 Cactus themed interior display for nursery/room decor section of the store. Featuring a muted pastel color palette and desert wall art and home accessories. Spring/Summer 2018. Swim themed window display featuring aquatic stuffed animals, summer fruit dishware and kid's swimwear. Spring/Summer 2018.